One of the most important things you can do as a homeowner is make sure that you have the name of a Chester tree removal professional you can trust when you find yourself in need of this particular service. When you are looking for someone to help with the responsibility of keeping up with your exterior property, including the health, growth, and condition of your trees, you need to contact the local Richmond Tree Service professionals at C.S. Flournoy today. Trees can be a blessing to your Chester home or business landscape, but they can also be a serious threat to your property if they aren't taken care of properly from time to time. Hiring an experienced professional to take care of them and get the job done is one of the best ways to make sure that this happens, and that your home stays safe from the risk of falling limb or invasive root damage. Even after you have a tree cut down, the stump can still pose a threat, which makes it equally important to work with a professional company that understands that the job isn't finished as soon as the trunk comes down. For all of your tree removal and stump grinding needs, the professionals at C.S. Flournoy have the experience and expertise to get the job done right the first time. If you have any questions about our full line of tree removal and care services, or you would like to schedule an appointment for your consultation, give us a call today. Our team of experts are always standing by and would be happy to answer any questions you may have. We look forward to working with you. 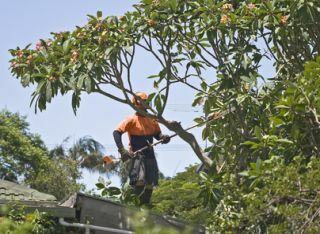 One of the most important landscaping services that often goes overlooked is that of professional tree removal. While the temptation can be strong to just pick up a chainsaw and have at it, it is always helpful to have a professional come out to your property and evaluate the condition of your trees to help determine which ones actually pose a threat to the security of your property, and which ones just need a little bit of care, and this is especially the case with large trees. The last thing you want is to have a massive tree branch come down on your home when it could have been safely removed if you had only had the professionals come out. A professional tree removal service can also be of great help if you are looking to expand the footprint of your home, as we will be able to help you clear away the unneeded trees that could threaten the security of your project. In many cases, a tree won't have to be completely removed, leaving a brand new bare spot in your landscape. Oftentimes, all it takes is a little careful trimming and you can continue to enjoy the shade provided from your trees without having to worry about stray branches falling off during a storm and putting a new hold in your roof. Our team of professionals can help you quickly determine which trees need to be cut back, and which can be left alone to continue enhancing the beauty of your property. For all of your tree trimming needs, you can trust the professionals at C.S. Flournoy to enhance the beauty of your home and to protect it at the same time. If you are looking for a Chester Tree Removal Company then please call 804-264-1000 or complete our online request form.